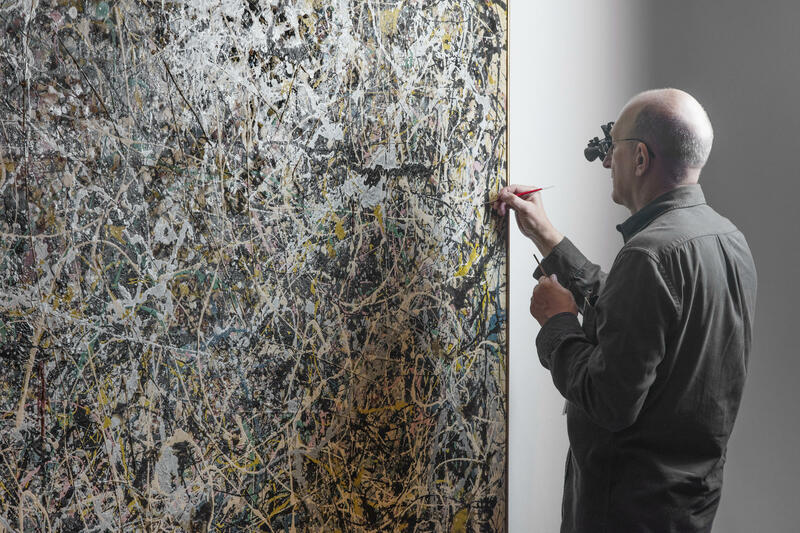 From March 4 to September 3, conservator Chris Stavroudis is part of the exhibition Jackson Pollock's Number 1, 1949: A Conservation Treatment at The Museum of Contemporary Art, Los Angeles. Stavroudis says he's "right on schedule" to finish his work by the end of the exhibition on September 3. Jackson Pollock's painting Number 1, 1949, is a swirl of multi-colored, spaghettied paint, dripped, flung and slung across a 5-by-8-foot canvas. It's a textured work — including nails and a bee (we'll get to that later) — and in the nearly 70 years since its creation, it's attracted a fair bit of dust, dirt and grime. That's where conservator Chris Stavroudis comes in: His job is to clean the painting using swabs, solvents, and tiny brushes. For the last several months, he's been hard at work, once a week, in full view of the public, in a gallery at The Museum of Contemporary Art, Los Angeles. Pollock used all sorts of paints — oil paint, house paint, car paint, radiator paint — and they all aged and got dirty in different ways. Working with the Getty Conservation Institute, Stavroudis did tests to see what kind of cleaning was needed. Stavroudis suspects the bee was unintentional (it probably just flew into the wet canvas as Pollock painted), but the nails weren't. Pollock added them for texture. Art conservation is as much detective work as aesthetic exercise — and a nail that fell out of the painting gave clues to Pollock's thinking. In the tiny indentation where a nail had been, Stavroudis saw a hairline of bright orange, under many dribbles of white. "Everyone always thinks of him as just slopping paint around," Stavroudis says, "but he looked at it, decided the orange was too bright, and took it down." Some high school students watch Stavroudis wield his swabs — they have to make their own Pollocks for school, and want to know how he painted. "The canvas was put on the floor and dribbled on," Stavroudis explains. "He used sticks and dipped them into house paint, enamel paint, and then dribbled the paint off the stick and onto the canvas." Rather than the floor, Stavroudis has mounted the painting on a vertical track attached to the wall. He can slide it up and down to get to different sections. This is the first time any conservation work has been done on Number 1, 1949, and because it's a 20th century work, it's harder to conserve than, say, a Rembrandt. "People have been working on oil paintings, traditional paintings, for a long time," Stavroudis says. So there's lots of accumulated information. With new, 20th century materials, however, there's much less conservation scholarship; they're still in the process of learning what happens when the swab meets the paint. When I checked in with Stavroudis the other day to see how it was going he said he recently learned about yet another material Pollock had used — tempera — what children use for finger painting. It's just one more challenge on Stavroudis' sixth-month quest to restore Pollock's work to its original condition, dead bee and all. "I'm nearly finished," he says. "I have to kind of slow down a little bit because I don't want to run out of painting to clean before the exhibition ends." But, he says, he's "right on schedule" to complete his work by the time the museum closes the exhibition on September 3. By then, Stavroudis will have spent more time working on the painting than Pollock did — "by an order of magnitude." All right, so once a week since March, an art conservator has entered a gallery at the Museum of Contemporary Art here in Los Angeles, aimed a spotlight at Jackson Pollock's painting "Number 1, 1949" and gone to work. He's cleaning the piece in full view of the public. This is a six-month project, and NPR special correspondent Susan Stamberg was there when it began. SUSAN STAMBERG, BYLINE: The enemy is grime, dust and dirt. Chris Stavroudis attacks it with cotton swabs, various solvents, tiny brushes. Jackson Pollock's painting is a swirl of paint - dripped, flung, slung in tendrils of color spaghettied (ph) across a 5-by-8-foot canvas. It's a challenge to viewers and conservators. Viewers say - huh? - or like Valerie Johnson (ph) from Rancho Cucamonga, wow. VALERIE JOHNSON: There's a lot of feeling, a lot of activity, emotion. You know, you feel like, whoa. STAMBERG: Conservator Chris is calmer, scientific. Working with the Getty Conservation Institute, he did tests to see what kind of cleaning to do, how to tackle Pollock's tangled, busy use of different paints. CHRIS STAVROUDIS: This is enamel and oil paint, and the two have aged very differently. STAMBERG: Over almost 70 years, the oil got grimy - the enamel - shiny house and car, even radiator paint - less so, although there was an accident during Pollock's dribbling. STAVROUDIS: There is a bee in the painting. STAMBERG: ...As in bzz (ph)? STAVROUDIS: Yes, as in bzz (ph). STAVROUDIS: Yeah, trapped - caught in the paint. STAMBERG: Think he did that on purpose? STAMBERG: But there are things Pollock did put in on purpose to add texture. STAVROUDIS: There are nails there. This is a nail. That's a nail. And this is where there was a nail that fell out. STAMBERG: Art conservation is as much detective work as aesthetic exercise. The nail that fell out gave clues to Pollock's thinking. In the tiny indentation where the nail had been, Stavroudis saw a hairline of bright orange under many dribbles of white - ta-da. STAVROUDIS: Everyone always thinks of him as just slopping paint around. But, you know, he looked at it, decided the orange was too bright and took it down. STAMBERG: Some high school kids are watching Chris wield his swabs. They have to make their own Pollocks for school and want to know how he painted. STAVROUDIS: The canvas was put on the floor and dribbled on. He used sticks and dipped them into just kind of house paint, enamel paint, and then dribbled the paint off the stick onto the canvas. STAMBERG: The kid's mother's going to love watching that in her living room. We're not slopping, Mom; we're making a Pollock. At MOCA, Chris Stavroudis is making a Pollock look better, trying to bring it back to the day the artist finally lifted off the floor of his Long Island studio. Chris has mounted the painting on a vertical track attached to the wall. He can slide it up and down to get to different sections. He says he prefers working vertically. But you might cause a drip in the wrong place by accident. STAVROUDIS: That's why I'm a trained conservator. STAMBERG: This is the first time Pollock's "Number 1, 1949" has been worked on. And because it's a 20th-century work full of innovation, radical ideas, new materials, it's harder to conserve than, say, a Rembrandt. STAVROUDIS: People have been working on oil paintings, traditional paintings for a long time. STAMBERG: So there's lots of accumulated information. With new stuff, there's not much conservation scholarship. They're just learning what happens when the swab meets the paint. STAVROUDIS: He mixed in a powder to color the white paint pink. STAMBERG: When I checked in with Chris last week to see how it was going, he had learned about a new medium Pollock had used in addition to the oil and enamel paint. STAVROUDIS: We think it was, like, children's tempera paint, the kind of things kids would use to make finger paints. STAMBERG: You've probably spent more time with painting than Pollock did. STAVROUDIS: Oh, by an order of magnitude, yeah - and looked at it much more carefully than he did. STAMBERG: You've been at this since March. It's a six-month project. How far along are you now? STAVROUDIS: I'm nearly finished. I have to kind of slow down a little bit because I don't want to run out of painting to clean before the exhibition ends. But we're right on schedule. STAMBERG: Chris Stavroudis getting down to his last swab, conserving Jackson Pollock's painting "Number 1, 1949" on view at the Museum of Contemporary Art in Los Angeles until September 3 - the bee survived the conservation, by the way. I'm Susan Stamberg, NPR News. (SOUNDBITE OF BOREALISM'S "FLY, LITTLE BLACKBIRD") Transcript provided by NPR, Copyright NPR.